← EN’s 12 Days of Christmas: Win a Rolling Travel Hay Bag from KPP! The USEF has named the 2015 Eventing 25 riders, and we’re excited to get to know each of them with a series of profiles on EN. These young riders are the future of our sport in the U.S., so remember their names and join us in giving them the recognition they deserve. Keep checking back for new profiles. Go Eventing 25! Helen Bouscaren and Ben. Photo by Sherry Stewart. 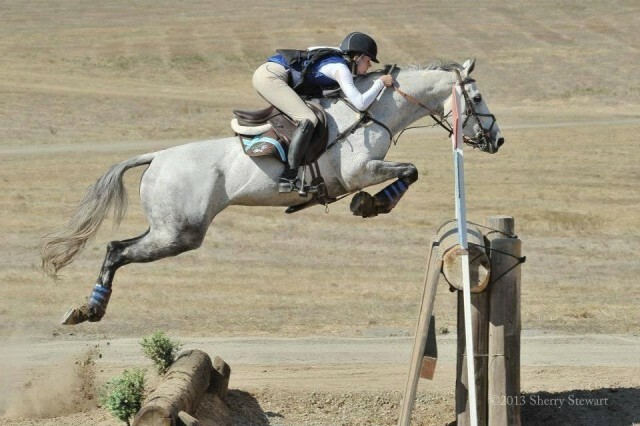 Helen Bouscaren was ready for some good news when she received word she’d been selected to the 2015 Eventing 25 program. After receiving an H.E. “Tex” Sutton grant from PRO earlier this year to compete at Bromont, she was unable to make the trip after her 10-year-old OTTB, Ben, suffered a minor injury. Ben has been sidelined since then but is coming back into work just in time to pick up training with the yet-to-be-named Developing Rider coach — it’s down to Mike Huber or Leslie Law — during the E25 training sessions. Helen’s got her eyes fixed on competing in her first CCI4* in Kentucky next spring, and she’s excited to have the opportunity to receive more training in preparation. Helen grew up in the Seattle area before moving to North Carolina for a brief working student stint with Rebecca Howard at The Fork. Once she completed that, she moved back to Seattle to return to school and eventually moved to California to work for James Alliston. Helen’s had Ben (Petersburg X Tough Duchess, by Tough Knight) since he was a scrawny 3-year-old that raced once in Canada. “He was very gangly and not a very good looking horse, but he was in my budget, so I started working with him,” Helen recalled fondly. Fortunately for Helen, she made the right decision, and she came away with a cross country machine that has skipped through the levels with her. “I kind of always thought he was a good horse,” she said. “A lot of the older style trainers I worked with liked him a lot, and once James took him out competing for me, he was on board as well,” Helen said. Helen and Ben made their Advanced debut at Twin Rivers in 2013, finishing their weekend strongly in fourth place. Later that year, they made their CCI3* debut at Galway Downs, where they placed seventh with just some time on cross country and a rail in show jumping. Since moving up to Advanced, the pair has not finished outside of the top 10 save for one technical elimination. Helen feels confident that Ben is the horse she wants to continue to gain experience on, beginning with Rolex next spring. Helen also has a couple of younger horses coming up that she feels will have talent for the upper levels in the future. In the meantime, she’s going to continue learning with her handsome gray partner, and she can’t wait to see where 2015 takes her. She’s off to a great start by being named to the Eventing 25 list once again, and we’re sure we’ve not heard the last from this talented pair.